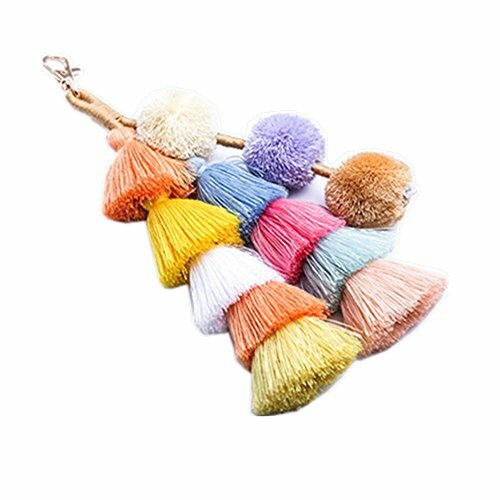 Hand Made Colorful Bohemian Tassel Bag Charm Keychain Handbag Pendant (Multicolored2) | What Should I Say? ❤️Application: It's the perfect gift for yourself or someone special. For bag charm, car key ring or for pets toy etc. ❤️Tips: because of the transportation, the fur ball and the tassels may be deformation, you can Sprinkle water and then use a hairdryer to blow slightly, it can restore the best effect of fluffy. ❤️BRUCEWANG brand professional hand-made for 12 years, this tassel keychain is our original design, quality assurance, other sellers' products we can not guarantee the quality, please rest assured to choose. there are any problems within 365 days. Please feel free to contact us and we will give you the most satisfactory answer. ❤️This colorful cotton pompom keychain with beaded accents is a lively way to identify your keys. ❤️Each piece is unique adding to its individuality and character. If you have any questions about this product by BRUCEWANG, contact us by completing and submitting the form below. If you are looking for a specif part number, please include it with your message.